anyone know how much all of this would cost? what do you mean stage 2? do you mean the 3" pulley? Who's tuning it? You might want to get 3.34" dialed in before taking it down. okay. i still think you should start with the stock pulley because if your tuner screws up somewhere along the way, and hitting wot @ 5psi and 17.0 is only possible so many times. don't wanna see you blow the motah. smaller pulley may mean 10psi @ 17.0. Twice as worse. i jus want to be sitting at 210-230whp...what should i go with?? We can help. SC with the 3.34" pulley should be a good, reliable setup for roughly 220whp. Everything "bolts on". Did I answer your question? What is your question? so how much $$ is the bottom line i mean to get everything you need have it installed and tuned does anyone know? Did you read this thread? It all depends on how much you pay for the parts. I'll put my numbers in. Take into consideration that I was one of the pioneers, and my prices are a bit high. no pic of one finished?! please some one post one, I'd like to see how it looks. Dude, I have a 2.4 and it's supercharged. Trust me, I know what it looks like. What is the listing price for the parts and is the power output worth it? BEAST! Whats the dyno numbers or ball park? The "dual pass" is a modification made to the intake manifold (where the coolant hoses go through the laminova cores). 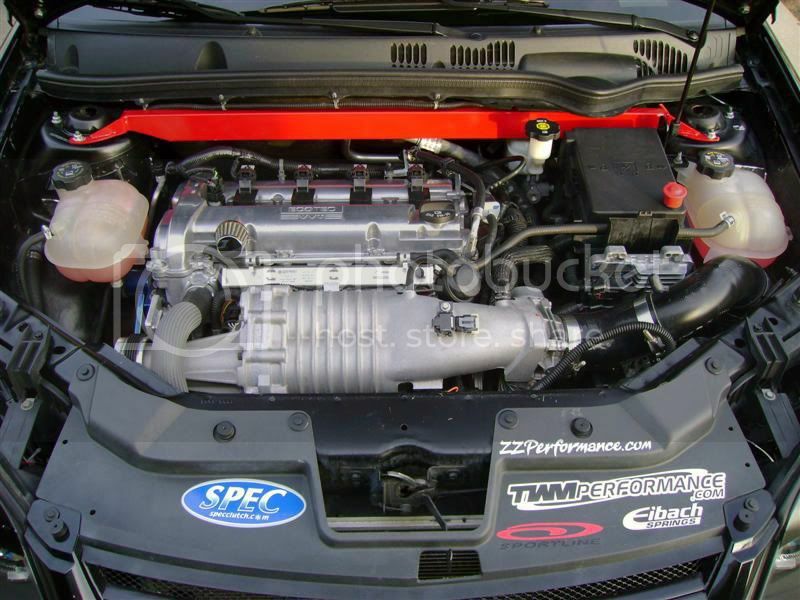 The "dual pass" modification is not necessary to run the supercharger on the 2.4, however, since you have the manifold off you might as well do it. It's easier. The second coolant tank contains the coolant for the intake manifold/heat exchanger. It acts as a reservoir for the coolant, and as long as you have the HE plumbed correctly, it is an overflow tank. It is absolutely necessary to have a second coolant tank for the intake manifold. It is a sealed system completely separate from the rest of the coolant system in the 2.4. SMG Motorsports makes a sweet bracket that fits on the passenger strut tower, and works perfectly with the spare coolant tank. all in all how much did those parts cost you?